New Orleans property swap may yield largest public riverfront in the U.S. - Archpaper.com New Orleans property swap may yield largest public riverfront in the U.S.
New Orleans property swap may yield largest public riverfront in the U.S.
On October 26, a historic deal was implemented in New Orleans: the Port of New Orleans (PNO) and the Public Belt Railroad (PBR) swapped riverfront properties, unlocking a key stretch of land to what may soon be the largest uninterrupted public riverfront in the U.S. 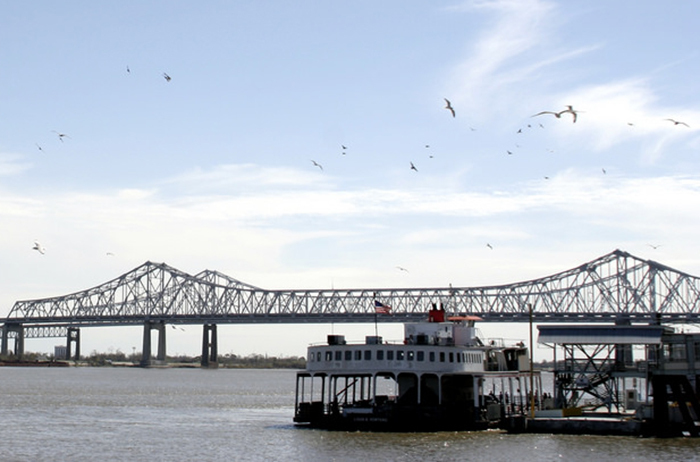 In the swap, PNO took ownership of a stretch of railroad along the Mississippi River and PBR took ownership of two large wharves–Esplanade Avenue and Governor Nicholls Street Wharves. PBR is owned by the City of New Orleans, which now plans to redevelop both wharves as public space (à la Mandeville Wharf). This redevelopment will connect two existing riverfront parks, Bywater’s Crescent Park and the French Quarter’s Woldenburg Park. This linkage is key in the long-term vision to develop the entire New Orleans riverfront as one contiguous public parkway, as detailed by Eskew Dumez + Ripple’s 2008 Reinventing the Crescent plan. In a press conference on October 27, New Orleans Mayor Mitch Landrieu announced several major riverfront redevelopments, including the keystone wharf redevelopments. The wharves themselves have been allocated $15 million. The other developments announced are generally focused on improving existing public amenities along the Mississippi riverfront from the French Quarter to Bywater neighborhoods. They include a $7.5 million renovation of Spanish Plaza, a $400 million renovation of the World Trade Center at the Four Seasons hotel, a new $37 million terminal for the Canal Street Ferry, a new $7.3 million pedestrian bridge over the railway to the ferry terminal, $6 million in park improvements for Woldenberg Park in the French Quarter, $3 million in green space improvements for part of the Riverwalk, and $31.2 million for expansions to Crescent Park. Many of these projects are ongoing. After a series of major floods this summer, water experts in New Orleans are paying close attention to how the city is spending on water management. “The challenge in New Orleans is that we can’t rub two nickels together to wrap up our water infrastructure and drainage problems,” said Ramiro Diaz, a designer at architecture firm Waggonner and Ball, in a call with The Architect’s Newspaper (AN). “Overall, I think it’s a positive development, though. People have been waiting for these riverfront projects for years.” Waggonner and Ball were the lead designers behind the Greater New Orleans Water Plan. According to Eskew Dumez + Ripple principal Steve Dumez, his firm is now looking into implementing the western end of the Reinventing the Crescent plan. This would open up riverfront property around the Ernest N. Morial Convention Center, extending the parkway even further.